I am honored and humbled to be among all these exceptional role models. I marvel at the magnificent Jewish women and thriving community that I am fortunate to know and learn from daily. 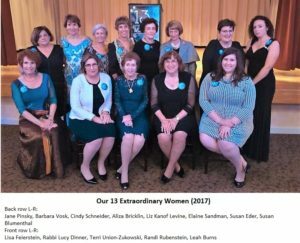 I was especially pleased that the 13 extraordinary women committee chose my dear friend, Anya Gordon’s, event center, the lovely and warm “The Glenwood” for this meaningful event. Imagine a small Jewish girl growing up in a small southern town, Norfolk, Virginia. I experienced first-hand segregation and anti-Semitism. 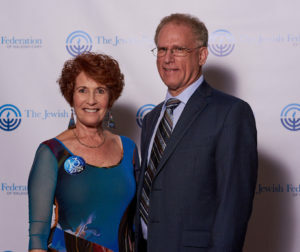 I lived in a community where families supported both synagogue life and the Jewish federation and understood that both together created a vibrant Jewish community. My parents provided security and modeled tzedaka and Jewish community involvement. My youth was spent hanging out on Sunday’s at the J, where I took part in plays including having the lead role of Anna in the King and I and Yenta in Fiddler on the Roof. I was the first teen representative to the federation board and the federation even sponsored a trip to Israel for 16 teen leaders, including myself. This was unprecedented in the 70s. All these experiences helped me overcome the sting of anti-Semitism. 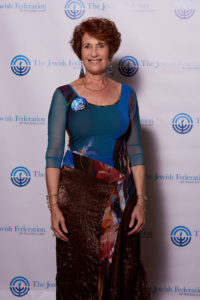 I experienced firsthand that being connected to a tribe, developing passions beyond your own desires and stepping up to leadership roles as a youth made me feel a connection that transcended anti-Semitism and hatred of any kind. Experiencing Israel first hand as a teenager wedded Israel to my heart and instilled my desire to protect and support her. Fast forward a few decades past my childhood. After easily convincing my then-young, northern spouse to move, this then-young Jewish southern girl headed back to a small Jewish southern community, Raleigh, convinced that the south is an ideal place to raise good southern Jewish children. My childhood experiences compel me to help shape, grow and nurture our Raleigh community, both secularly and judaically, so that I could provide meaningful Jewish experiences for my children. As I look towards future grandchildren in my life this work becomes even more vital. I give in ways that are impactful, that move people and organizations forward beyond their current capabilities and that continuously ripple outward. This, my friends, fills this Southern Jewish soul with meaning, connection, joy and happiness beyond her wildest imagination.